Germany hosted the NATO Response Force Air Live Exercise 'BRILLIANT ARDENT 2010' (BAT 10), during April 12-22. Giampaolo Tonello provides the photos, having visited Wittmund AB in Germany on April 14th to spot the fighters of some of the participating nations. Wittmund Air Base in Wittmundhafen, Niedersachsen, is home to the Luftwaffe's last operational F-4F wing, JG 71 "Richthofen". The smokey, relatively large jet can make one feel quite nostalgic. The Phantoms will continue to serve until JG 71 has received enough Eurofighters, starting in 2012. With at least one pair of F-4F Phantoms taking off twice a day to participate in BRILLIANT ARDENT, Wittmund was probably the best place to visit during this exercise. Making Wittmund much more interesting during BRILLIANT ARDENT for the more experienced European spotter, with probably enough F-4F Phantoms on file, were the Turkish F-16C/Ds. Although "just" F-16s, these Turkish birds from 182 Filo are not seen as often as most other warplanes in the exercise. The French deployment to Wittmund AB with the Mirage 2000N added a welcome third type to the mix. BRILLIANT ARDENT or not, normal flying continues on good days like this was. Not taking part in the exercise, this Tornado IDS(T) from Aufklärungsgeschwader 51 (Recce Wing 51). Coming from Jagel AB, Schleswig, this training version of the Tornado IDS probably came by for a routine practise landing. Also seen was one of the Douglas A-4N Skyhawks of BAE Systems - Flight Systems. Operated by E.I.S. Aircraft GmbH, the six BAE Systems A-4N Skyhawks are used as target tugs providing visual target training for the Luftwaffe. Permanently based at Wittmund, it is unofficially known as 713 Staffel (3rd Squadron of JG 71). Normally seen in overall white with blue stripe, the pictured example is one of two acquired from the US firm ATSI in 2007. The NATO Response Force comprises deployable NATO Land, Maritime and Air Forces provided by the member nations on a rotational basis of six months, and has now entered its 15th rotation. In preparation for the NATO Response Force 15 (NRF-15) standby phase which lasts from July 1 to December 31, 2010, three major live exercises were held: BRILLIANT LEDGER for the land component, BRILLIANT MARINER for the naval component, and BRILLIANT ARDENT for the air component of the Response Force. BRILLIANT ARDENT 2010 (BAT 10) was hosted by Germany and lasted from April 12th to the 22nd. The exercise was directed and controlled from Izmir in Turkey by Commander Allied Air Command Izmir. BRILLIANT ARDENT evaluates and certifies the interoperability, readiness and capabilities of the NRF air forces and its command. To train, test and integrate the NRF air units of the different nations the exercise uses a scenario based around a UN mandated NATO-led Crisis Response Operation in a fictitious geo-political setting. NRF-15 Air Forces from the Czech Republic, France, Germany, Italy, Poland, Turkey, and the US participated with around 60 aircraft ranging from fighters, attack aircraft, helicopters, tanker and airborne early warning aircraft. Germany not only hosted the exercise but also provides assets to the air component of NRF-15. Jagdgeschwader 71 (Fighter Wing 71) from Wittmund air base in Wittmundhafen, Niedersachsen, contributed two F-4F Phantom II fighter aircraft to the NATO exercise. Thanks to their 'ICE' upgrade, the Luftwaffe F-4F Phantoms are capable of BVR combat with the AIM-120 AMRAAM. JG 71 is the last Luftwaffe F-4F wing, and will begin conversion to the Eurofighter in 2012. For F-4F photos, see right. In addition to the two Luftwaffe F-4F Phantom II fighter interceptors taking part, the German Air Force also provides Tornado fighter-bombers. Coming from Lechfeld in Bavaria, Jagdbombergeschwader 32 (Fighter Bomber Wing 32) sent deployed Tornados to Jagel AB in Schleswig-Holstein. JaBoG 32 is the only Luftwaffe unit that flies the Tornado ECR variant, a dedicated SEAD/DEAD platform armed with the AGM-88 HARM. The French Air Force participated with three variants of its Dassault Mirages. The deployed contingent led by Major Frederic Ohrenstein took part with four Mirage 2000N fighters, the Armée de l'Air sent five aircraft to Wittmund AB, supported by C-160 Transall flights. The Mirage 2000N fleet has been brought up to K3 standard, to handle the improved ASMP-A nuclear missile. The nuclear role will eventually be taken over by Rafale units when the 2000N is withdrawn from use in the near future. Within the NRF exercise, it is more likely they only simulated conventional weapon loads. The aircraft came from two units, EC 2/4 'La Fayette' from BA116 Luxeuil and EC 3/4 'Limousin' from BA125 Istres. For photos, see right. The French Air Force also took part with aircraft flying from their homebases. Four Mirage 2000D from BA133 Nancy and two Mirage F1CR from BA112 Reims. Mirage F1s are slowly but increasingly being withdrawn from service, however the F1CR reconnaissance versions are relatively young and will continue until final retirement in 2014. The Mirage F1CR still is the AdlA primary recce platform, with the medium-altitude Omera 33 or low-altitude panoramic Omera 40 internal camera, and the Presto long-range camera pod, until finally enough Rafales are on strength with the Reco NG pod. Furthermore it is perfect for day-time Close Air Support with its internal 30mm cannon, a weapon not available on the 2000D. It can carry GBU-12s, but needs another platform to guide the bomb, for example the 2000D. The Mirage 2000D is specialised in the conventional attack role and will remain in service for many years to come. Equipped with the PDL-CTS laser pod and laser guided bombs, as well as capable of employing the Apache/Scalp cruise missile, it is arguably a better NATO bomber than the 2000N. Furthermore the 2000D aircraft were equipped with new radios, Improved Data Modem datalink and ROVER capability for NATO combat operations in Afghanistan and soon the Damoclès laser designator pod will replace the old PDL-CTS pod. Also taking part in the concurrently running NRF-15 maritime exercise BRILLIANT MARINER, the French aircraft carrier Charles de Gaulle deployed to the North Sea. The Aéronavale took part in BRILLIANT ARDENT with six of the embarked Rafale M multi-role fighters of Flottille 12F. All Rafale Ms in service today are F3 variants, by early November 2009 all aircraft delivered to F2 standard have all been upgraded. While the improved F2 standard already added air-to-surface capabilities, standard F3 turned the Rafale into a true multi-role fighter, introducing the Pod Reco NG reconnaissance pod and the AM.39 Exocet anti-ship missile. The Italian Air Force participated with six Eurofighter Typhoon multi-role fighters belonging to Grosseto-based 4 Stormo, having deployed to Laage AB in Mecklenburg-Vorpommern. Major Marco Bertoli led the contingent of 120 personnel, which were flown in by three transports to Laage. Laage is currently the primary Luftwaffe Eurofighter base, with JG 73 being the first fully equipped German Eurofighter wing and many Neuburg-based JG 74 aircraft are also stationed at Laage for the moment. JG 74 will take on the NATO commitment in NRF-17. The Italian Air Force Typhoons in today's rotation are however limited to air-to-air combat, as the ItAF only employs the new fighters for air defense. One Italian C-130J Hercules also took part in the exercise, flying from Hohn. The Czech Air Force participated with four JAS 39C/D Gripen fighters as well as four L-159A ALCA light combat jets, both from Cáslav air base. Maintenaince crews were sent to Neubrandenburg airport in Mecklenburg-Vorpommern to service the jets on their turn-around. The airfield in Neubrandenburg is both a civil airport as well as military base, serving as diversion field for the nearby Laage Air Base. The initial release of participants by the Luftwaffe stated two Polish Air Force F-16 fighters taking part from the 31st Poznan-Krzesiny air base. However according to Polish sources, actually four 10.ELT F-16s from the 32nd air base at Lask were sent to Germany for the exercise, with refueling taking place at Diepholz in Niedersachsen. The 10.ELT at Lask is Poland's second F-16 unit, having received the its complement of F-16C/D Block 52+ fighters from 2008 onwards. The Polish Air Force also supported the exercise with a single Mi-8RL helicopter. It operated out of Diepholz, home to the German Air Force Maintenance Regiment 2, after arriving on the 13th from Krakow with a refuelling stop at Holzdorf. The Turkish Air Force deployed five F-16C/D Fighting Falcons and about 60 personnel to Wittmund AB. The 182° FiLO F-16s came from Diyarbakir, East Turkey, supported by a 101° FiLO KC-135R tanker from Incirlik, near Adana. Led by Lieutenant Colonel Ishak Dayioglu, the contingent took part in the exercise with four jets. 182° FiLO Atmaca (Hawk) flies the Block 40 version of the F-16. For photos, see right. U.S. Air Forces Europe provided the U.S. contingent for the exercise. The 22nd Fighter Squadron of the 52nd Fighter Wing at Spangdahlem AB took part with six F-16C/D Fighting Falcons. Because these aircraft are Block 50s configured for the Suppression of Enemy Air Defenses (SEAD) role with full autonomous employment capability of the AGM-88 HARM anti-radar missile with the HARM targeting system (HTS) pod, they are unofficially known as F-16CJ/DJ. Spangdahlem Air Base in Germany has been in use by the U.S. Air Force since September 1, 1952. The 52nd Fighter Wing's presence dates back to December 31, 1971, when it was still designated Tactical Fighter Wing. 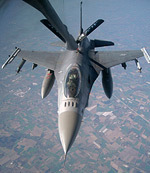 The 22nd FS "Stingers" was assigned to the 52nd Fighter Wing on April 1, 1994 and equipped with F-16C/D Block 30s. In 1998, receiving the Block 50s, the squadron became a "Wild Weasel" unit. Under the Combat Air Forces Restructuring plan 21 F-16s have departed Spangdahlem and the 22nd FS is set to merge with the 23rd FS to a single, slightly larger F-16 squadron, possibly with a different squadron number in accordance with historical precedence. Airborne Early Warning and Control was provided by two E-3A Sentry AWACS aircraft from the NATO AEW&C Flight at Geilenkirchen AB, Germany. Also flying from the AWACS base was the Turkish Air Force KC-135R tanker. The 351st Air Refueling Squadron from RAF Mildenhall in England supported the exercise with KC-135R tankers as well, either one with flying boom to refuel the receptacle equipped planes or with hose-and-drogue. The French Air Force also sent one of its tankers to support its probe-equipped aircraft, especially the six jets operating from France. In addition to aircraft, the exercise also involved ground air defense units from Germany, deploying the PATRIOT missile system and associated command and control. Flugabwehrraketengeschwader (FlaRakG - SAM Wing) 2 "Mecklenburg-Vorpommern" deployed to the Munster-Lager training area with three squadrons bringing more than 200 vehicles from their home garrisons in Bad Sülze, Warbelow and Gubkow. They were joined by two additional combat squadrons of Flugabwehrraketengruppe (SAM Group) 23 from FlaRakG 5, Manching. In total 710 personnel assembled at Munster-Lager. As stated Allied Air Command Izmir commanded the exercise and controlled the exercise scenario. Naturally, many other NATO command and control agencies were involved, from logistics to air traffic control, ranging from tactical levels to coordination with civil authorities. The exercise was an important test for the Meßstetten Control and Reporting Centre (CRC) at the Heuberg training area as the Tactical Air Control and Command Sector 1 was subjected to a NATO Force Evaluation (FORCEVAL) process. On April 15, the volcanic ash cloud caused by the eruption of Eyjafjallajökull in Iceland was approaching Northern Germany. During the afternoon most flights over northern Europe were suspended. At Wittmund and most other locations the afternoon mission was cancelled. The Italian Eurofighters operating out of Laage did fly in the afternoon, but were the only aircraft in Germany to fly for the exercise. Although causing quite a disruption for the exercise flying, it was also considered an unplanned but challenging test for the command at Izmir to adapt. The next day the ash cloud grounded the entire exercise fleet. After the weekend, on Monday April 19, the ash cloud passing over North Germany still grounded the exercise and flights scheduled for the day were again cancelled. Which was also unfortunate for the media as the exercise's media day was planned on the 19th. The NATO Allied Air Command Izmir Public Affairs (PA) staff was not able to fly to Laage air base, thus the news conference and exercise brief were cancelled. Nevertheless, the event went ahead with a base tour and a presentation of one of the Italian Air Force Eurofighter Typhoons, single-seater M.M.7299 with 'Diecimila ore' special tail. On April 21, European airspace was finally declared open again and the exercise could continue. However with the exercise coming to an end, only few missions were flown. Fear over further disruption of flights led to some of the deployed participants to return or stay home. The Italians stayed at Laage and the Turkish F-16s at Wittmund until departure on April 23 as planned. Although the latter contingent was noted trying to leave for home earlier, but a technical problem with one of the jets delayed their departure. The Luftwaffe reported on their site that despite the disruption, the exercise was deemed a success based on the first week. Report by Niels Hillebrand. Photos by Giampaolo Tonello ( view portfolio ) additional photos from Bundeswehr / Luftwaffe and U.S. Air Force.